Indianapolis, IN / Washington, D.C. – At today’s annual meeting of Eli Lilly investors held in Indianapolis, Indiana, in response to a question from a representative of the National Center for Public Policy Research, Eli Lilly CEO Dave Ricks admitted that ObamaCare has not lived up to its promises as the law fails to reward innovation, and said ObamaCare’s benefits to the company have been marginal at best. The National Center for Public Policy Research’s Free Enterprise Project (FEP) – the nation’s leading proponent of free-market investor activism — has repeatedly worked to hold the pharmaceutical industry responsible for the pain and suffering caused by ObamaCare. The industry’s lobbying arm, PhRMA, dedicated $150 million to an advertising campaign promoting ObamaCare, and the industry worked closely to get the law passed through Congress. Eli Lilly is a member of PhRMA. Mr. Ricks, millions of Americans are struggling under the market-distorting mechanisms of the Affordable Care Act. Eli Lilly played a major role in that suffering through its integral role in the implementation, promotion and defense of ObamaCare. As you know, PhRMA dedicated $150 million on advertisements to promote ObamaCare. Now that there is an actual opportunity to repeal and replace ObamaCare with a more market-oriented health care delivery system, it is incumbent upon corporations responsible for ObamaCare’s creation to be part of its solution. As the current political climate offers a unique opportunity for both private industry and health care consumers, I have a few quick questions: What message do you have for the millions of Americans who have seen their health care choices diminish, premiums rise, deductibles go through the roof, or well-being otherwise harmed by ObamaCare? Will you commit to work with the Trump Administration on health care reform? And what specific reforms would you suggest to the new President? Breaking from traditional shareholder meeting formatting, Eli Lilly had Danhof turn in his question in advance and a truncated version was read by the company’s corporate secretary. The full text of Danhof’s question, as prepared for delivery, is available here. In other news from today’s shareholder meeting, the National Center once again helped usher defeat of a left-wing shareholder proposal designed to limit free speech rights. In advance of today’s meeting, the National Center issued a press release urging all Eli Lilly investors to vote against a “fake transparency” shareholder proposal submitted by the New York State Comptroller. Free speech is under attack from liberals in nearly every corner of America. While liberal efforts to silence speech on college campuses and in the media are well known, there is also a coordinated attack on corporate free speech that is being spearheaded by the likes of the New York Comptrollerâ€¦ Under the guise of transparency and good governance, this liberal network launches dozens of assaults annually on corporations that dare to work with pro-business nonprofits and trade associations. We hope that Eli Lilly’s investors will join with us in rejecting this insidious attack on free speech. At today’s meeting Lilly’s investors voted down the NY Comptroller’s proposal. Today marked the fourth time FEP has participated in a Lilly shareholder meeting. In 2016, after the company participated in a campaign against a religious freedom protection law in Indiana, FEP promoted its own Lilly shareholder proposal that asked the company to identify criteria for operating in regions with significant and systemic human rights violations. This also marks the fourth time this year that FEP’s Director Danhof has confronted health care executives at their shareholder meetings to ask them about their role in ObamaCare and how they might work with the Trump Administration on health care reform. Another health care provider in the pharmacy industry, Walgreens Boots Alliance, indicated to the National Center in January that it would be willing to help replace ObamaCare. Walgreens Chairman James Skinner told Danhof the company would be willing to work with the Trump Administration in finding a free-market alternative to ObamaCare. Following that meeting, Danhof joined former Rep. J.D. Hayworth on “Newsmax Prime” to discuss why it is important for corporations to work with the Trump Administration on health care reform. In April, Danhof confronted Humana CEO Bruce Broussard with a similar question. At that meeting, Humana all but abdicated the company’s responsibility to be involved in the health care reform process. And last week, Danhof confronted Johnson & Johnson CEO Alex Gorsky with a similar question. Gorsky tried to downplay Johnson & Johnson’s responsibility for ObamaCare, but did vow to work with the Trump Administration on reform. 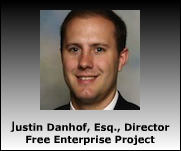 Launched in 2007, the National Center for Public Policy Research’s Free Enterprise Project is the nation’s preeminent free-market activist group â€“ focusing on shareholder activism and the confluence of big government and big business. Since 2014, National Center representatives have participated in nearly 100 shareholder meetings to advance free-market ideals in the areas of health care, energy, taxes, subsidies, regulations, religious freedom, food policies, media bias, gun rights, workers’ rights and many other important public policy issues. This is the eleventh shareholder meeting FEP has attended in 2017.